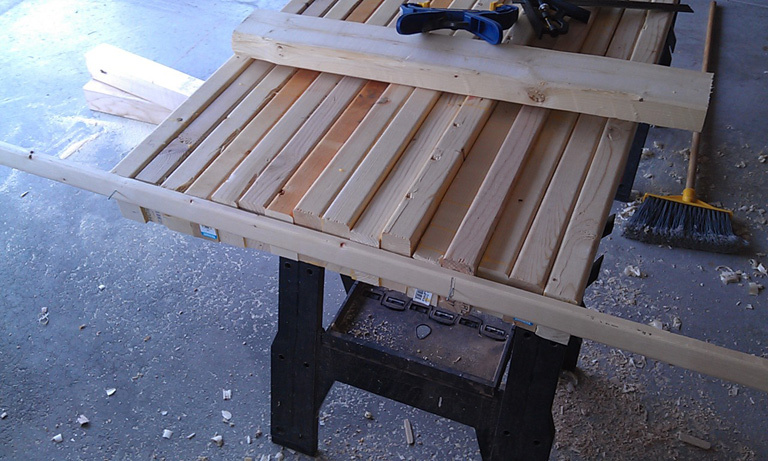 ← Workbench Day 13: Dry fit the base! Workbench Day 14: Trimming Tenons and legs. I wasn’t sure how much time I’d have today to work on the bench so instead of charging ahead with measuring the height of the legs to get ready for installing the top, I decided to do some more mundane tasks. They still are in general preparation for the top, but I just wasn’t planning on doing them first. 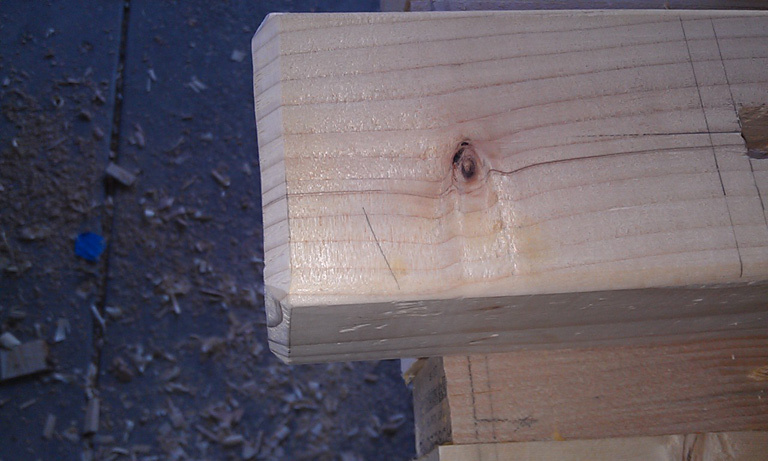 So is this a half-lapped tenon? All I did was take my crosscut saw and cut out a notch the appropriate thickness, then take my chisels and pop off the waste. It took all of about 10 minutes to get all the joints cut like this. Once I had everything trimmed, I put it all back together and now every joint is crisp and tight. That’s much more satisfying to me. I mean, yesterday I thought to myself, self, you know this is going to be just a workbench right? It’s going to get abused and used and left out here int he garage…so what if 3 of the 4 joints are off by about 1/16″? But no. If I’m going to do this, I’m going to do it to the best of my abilities. While it may not be much to look at in the end anyway, I will at least have no small amount of pride in the fact that there was nothing short of throwing money at the darn thing that will have made it better. Cause throwing money at a problem always makes it better. Right? Next, it was on to figuring out how to connect the top. My original idea was to borrow the technique from Chris Schwarz’s Workbenches book and do half-blind mortises into the bottom of the top, then drill and peg from the front. But, his top is a lot bigger and a lot more evenly dimensional than mine (another lesson learned!). The other option I’ve been kicking around since I started designing this thing was to use the Ian Kirby method of a cross-piece under the top at the legs, bolted through the top. In fact, I’ve received a number of suggestions so far that entail that method. With the irregular bottom surface of the top that I have, I think that’s ultimately the best choice. Now that the decision is made, how to go about doing it? I mean, look at it…I flipped it over for this picture and you can see the slight bow, which I’m confident I can flatten out, but look at all the uneven 2x4s left after my over-engineering! That’s when I hit on a solution. Tack one of the little strips cut off earlier to make the top (that’s some payback right there) to the side and make a level platform from the front to the back to rest another cut off piece of 2×4. This way the cross piece that will be under the top from front to back will support the whole top, not just the high points (or low points, I guess, once the top is flipped back over): Then rest a piece of 2×4 offcut which happens to be the right length on it and trace the profile of the raised portion of the bottom. Then once I have the profile, cut it! If I’ve done this correctly, I believe I’ll have a nice tight fitting support under the top that I can drill through and bolt down. The actual cutting out of the pattern will have to wait though…daddy duty called! A native son of Delaware, now living in Illinois, Steven is a writer, family historian, amateur astronomer, sometimes-gardener, woodworker, father to three wonderful children, husband to a wonderful wife, and caretaker of one cheeky vizsla. 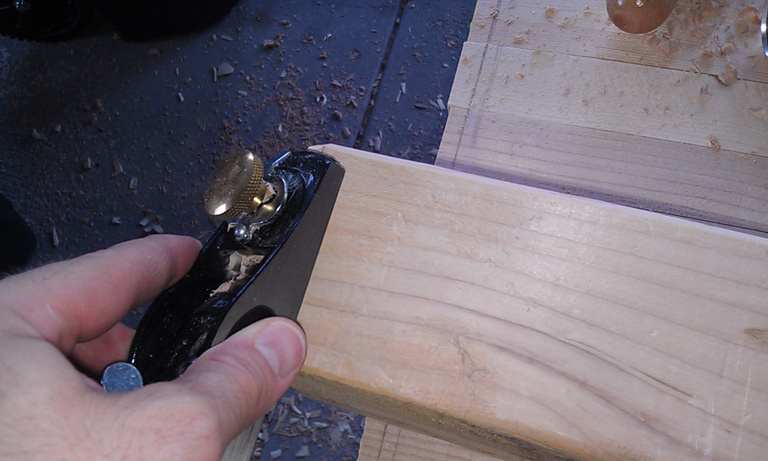 This entry was posted in Workbench and tagged block plane, chisel, chisels, crosscut, crosscut saw, dry fit, hand plane, mortise, tenon, workbench. Bookmark the permalink. 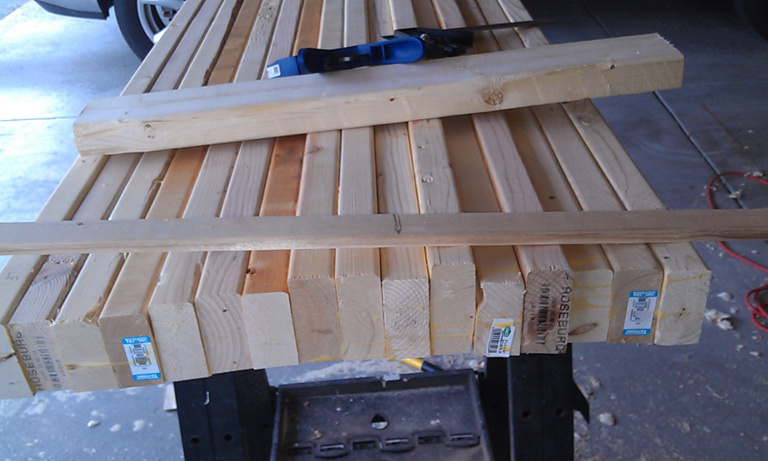 4 Responses to Workbench Day 14: Trimming Tenons and legs. Just notch the bottom of the table top where the stretchers go. If you want to get it done fast, clamp a 2×4 to the bottom of the bench (flat) and run the circular saw with the base riding on it and you will be cut to an even depth that will cut down “most” of the highest boards. Do this on both sides of the notch and a few runs in between. Knock out the pieces and clean up with a chisel. You don’t need 100% contact. You just need the bottom level where you can run lag bolts up through the stretcher into the bottom of the table. That way you don’t have icky metal bits sticking out on the top of the table to snag your nice sharp tools. One more thing, you can do the same trick across the whole bottom to even it up a bit if the uneven run of boards offends your sensibilities. Traditionally, this is where you would pull out the adze or broad hatchet and go to town. The general workflow for something like this would be to whack it even with the adze or broadaxe (or hatchet), then smooth it out a bit with a scrub plane, and finish off with a more finely set jack plane. That’s it for the non-show sides. The show sides you spend a little more time with a smoother or a jointer depending on if smooth or level is the objective. It is much like working through the grits on sandpaper when sharpening. Remove the bulk of material that you don’t want as fast as possible. Then get finer as you approach the surface you want. The fastest way to remove material is to split it. Saw or chop stop cuts to control the splitting. Then knock out the pieces between the cuts. 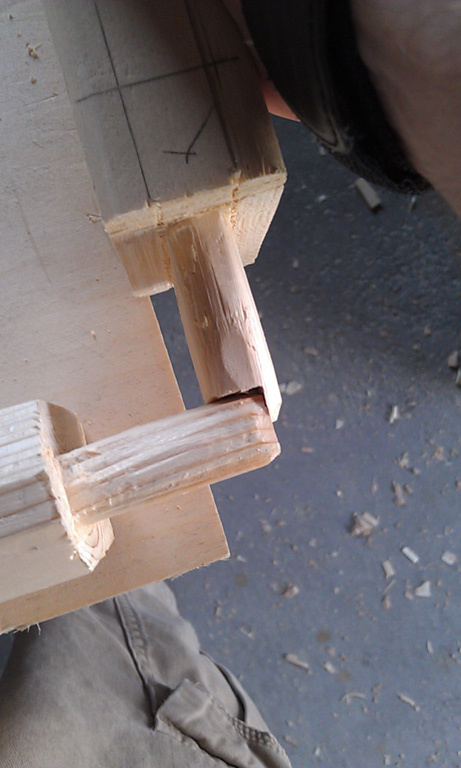 Work across the grain where it splits easiest. Finish up by smoothing out the uneven bottom of the split. What? You don’t have and adze or a broadaxe? That’s ok, Just grab the biggest chisel you have. It will do the same thing. 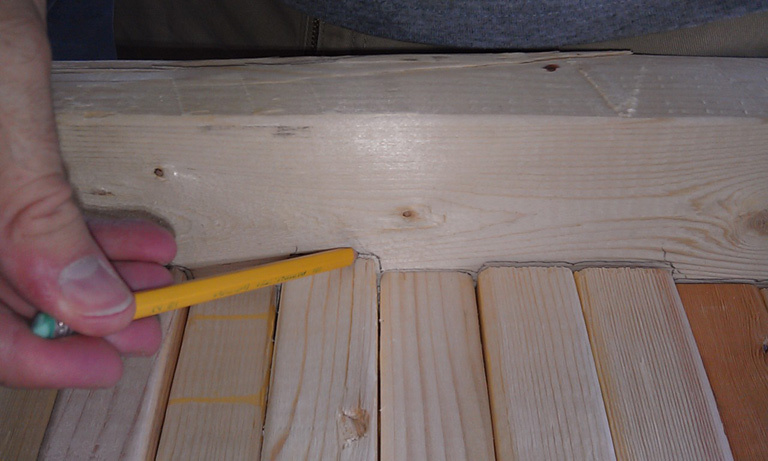 You will just be working in chunks of the width of the chisel instead of 3″ or 4″ for the coarser tool. It still works. Just takes a little longer. Haha—I don’t even have a jack plane, let alone a broadaxe or adze! I seriously thought about trying to level out—or at least rough out—the bottom of the top (that sound silly) because, well it did sort of offend my sensibilities by being all ragged and uneven. But, after examining the top and chopping out that little bit as you suggested to fit the top to the rails (rather than fit the rails to the top like I was intending to do yesterday), I think I may keep the crazy uneven bottom. I will use it as a reminder to think a little bit more before I start in on hacking away with powertools. It really doesn’t look all that bad to me and it kind of gives the bench some personality! Hey, if you change your mind, it will still be there. It will have no impact on it’s functionality. If and when you decide to flatten it a bit, you know how to do it now. I am a hobbyist woodworker, looking to sharpen my skills (and my planes) and have some fun along the way. Get yer email updates here! Enter your email address to get post updates.